SOMERTON, Ariz. (March 2, 2013) For the second time in as many nights, Jason Johnson found himself in victory lane at the Cocopah Speedway with the Lucas Oil American Sprint Car Series presented by MAVTV American Real, only this time the check was worth $10,000 to bring his weekend winnings to $13,000 in the first two rounds of the Cocopah Cup Challenge. Drawing the pacers position in the night’s 30 lap feature event, Johnson immediately took off into the race lead with Logan Forler holding the runner up spot before surrendering the spot to Lucas Wolfe on Lap 2. Caution lights blinked on around the Cocopah Speedway on Lap 6 as the No. 57x of Dalten Gabbard rolled to a stop in turn two, eliminating a 2.618 second advantage held by Johnson over Lucas Wolfe. Mingling with the back of the field on lap thirteen, racing would again be slowed as the Pettit Oil Company No. 27 of Mitch Olson spun while running eighth on Lap 17. On the restart, Lucas Wolfe assumed the role of predator, stalking the MVT No. 41 back into slower traffic. Working the cushion through turns three and four, the Buffalo Wild Wings No. 82 of Lucas Wolfe ran any line not occupied by Johnson; picking up the most ground through turns one and two but unable to complete the pass at the opposite ends of the Cocopah Speedway despite pulling nearly even with Johnson on several occasions. With slower traffic playing to his advantage, Johnson raced to victory ahead of Lucas Wolfe and Brady Bacon, who held off the final lap charge of Tony Stewart, to take the final step on the podium by a mere 0.016 seconds at the checkered flag. Seth Bergman climbed from eleventh to round out the top five. Danny Lasoski, who earned the nineteenth starting spot following a third in the night’s The Joie of Seating B-Feature came up to finish sixth with B-Feature winner Brian Brown earning seventh. Logan Forler, after running in the top five for the first 16 laps, slipped to eighth followed by Wayne Johnson and Roger Crockett as the drivers in the top ten. Earlier Hear Race wins went to Cole Wood in Ti22 Heat one followed by Roger Crockett in the second Heat presented by BMRS. Wesmar Heat three belonged to Logan Forler with Lance Norick taking Rod End Supply Heat four. The Joie of Seating B-Feature was won by Brian Brown. The Hawk Performance Products Fastest Lap of the Feature went to race winner Jason Johnson. 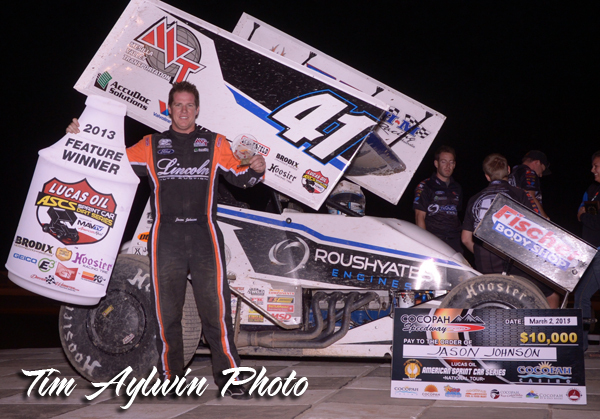 The Lucas Oil ASCS presented by MAVTV American Real takes time off with the schedule resuming at the Devil’s Bowl Speedway on March 22 and 23 for the Spring Nationals and Matt Clevenger Memorial. Cocopah Speedway - Somerton, Ariz.